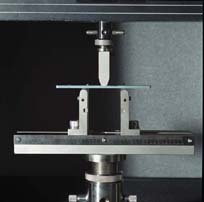 The flexural test measures the force required to bend a beam under three point loading conditions. The data is often used to select materials for parts that will support loads without flexing. Flexural modulus is used as an indication of a material’s stiffness when flexed. Since the physical properties of many materials (especially thermoplastics) can vary depending on ambient temperature, it is sometimes appropriate to test materials at temperatures that simulate the intended end use environment. Most commonly the specimen lies on a support span and the load is applied to the center by the loading nose producing three point bending at a specified rate. The parameters for this test are the support span, the speed of the loading, and the maximum deflection for the test. These parameters are based on the test specimen thickness and are defined differently by ASTM and ISO. For ASTM D790, the test is stopped when the specimen reaches 5% deflection or the specimen breaks before 5%. For ISO 178, the test is stopped when the specimen breaks. Of the specimen does not break, the test is continued as far a possible and the stress at 3.5% (conventional deflection) is reported. A thermal chamber is installed on the universal test machine. The chamber is designed to allow the test mounts from the base and crosshead of the universal tester to pass through the top and bottom of the chamber. Standard test fixtures are installed inside the chamber, and testing is conducted inside the controlled thermal environment the same as it would be at ambient temperature. The chamber has internal electric heaters for elevated temperatures and uses external carbon dioxide gas as a coolant for reduced temperatures. A variety of specimen shapes can be used for this test, but the most commonly used specimen size for ASTM is 3.2mm x 12.7mm x 125mm (0.125" x 0.5" x 5.0") and for ISO is 10mm x 4mm x 80mm. Flexural stress at yield, flexural strain at yield, flexural stress at break, flexural strain at break, flexural stress at 3.5% (ISO) or 5.0% (ASTM) deflection, flexural modulus. Stress/Strain curves and raw data can be provided.